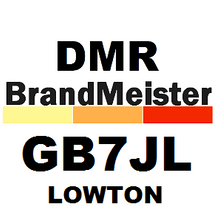 The GB7JL Brandmeister DMR Repeater formerly located in Golborne is now located in Lowton just 1.25km south of the Golborne Location but still in the Borough of Wigan. When my son M3JON died my wife and I had nobody to becone the beneficiary to our wills so we decided to make the RSGB Legacy Fund the benificary and I set about putting this into action by making contact with the RSGB requesting information I received a TWO WORD email from the then general manager saying "Read Website" I made three more atempts to obtain the information I required and our DRM Dave Wilson also made contact for me but still no reply. At this point seeing how much was already in the Legacy Fund I decided they must have enough and did not need our money so we decided that we would leave it to a local Christian charity. "A SIMPLE GUIDE TO DMR IN THE UK"
The New Version is now available in an on-line format . 9990 Echo Test on TS-1 or TS-2, is a Private call ( NOT a Group Call ) In YOUR Contact List. Timeslot 2 implements the use of reflectors similar to the Dstar network. The easiest way to use the reflector is to program your radio with Talkgroup 9 (local) in timeslot 2. This is the only talkgroup you will need for a QSO on the reflector. To link and unlink the reflector, program the radio with the reflector number as a group call on timeslot 2. To link to a reflector, select the reflector number from the contacts list and transmit for about 1 second. The repeater should respond with a voice announcement, "Connect to reflector xxxx". Then go back to Talkgroup 9 to make a QSO. To unlink select 4000 from the contacts list, transmit for about 1 second, and you should hear a voice announcement "Reflector Disconnected". To enquire about the reflector link status call 5000, and the repeater will respond with the currently linked reflector. ACTIVE Reflectors in the UK. but we ask our users to support UKFMGW and help maintain it's network of repeaters. Welcome to the website of the new relaunched GB7JL repeater now located in Lowton less than quarter of a mile from the original site.